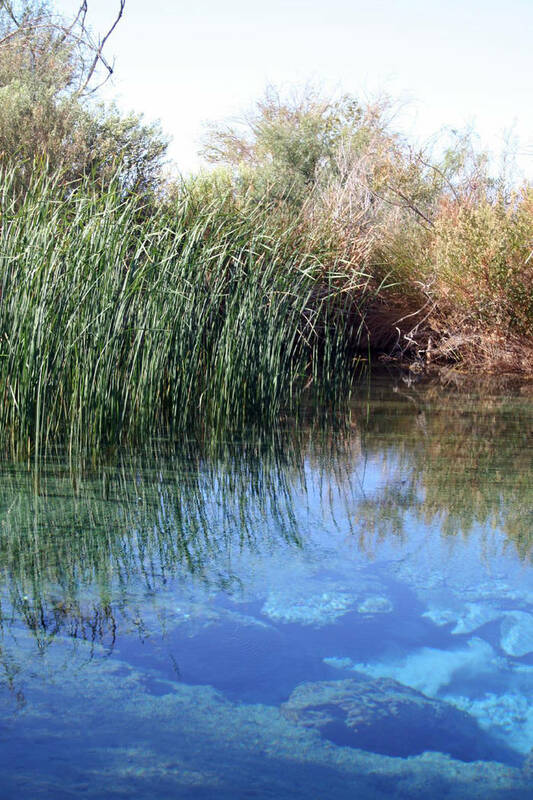 Ash Meadows National Wildlife Refuge, northwest of Pahrump, is one of the largest oases in the Mojave Desert. Deborah Wall The King’s Pool at Ash Meadows National Wildlife Refuge in Nevada acan be found at the Point of Rocks area. Desert bighorn sheep can sometimes be seen here. Deborah Wall Ash Meadows National Wildlife Refuge encompasses about 24,000 acres, including seven major springs and their accompanying wetlands. 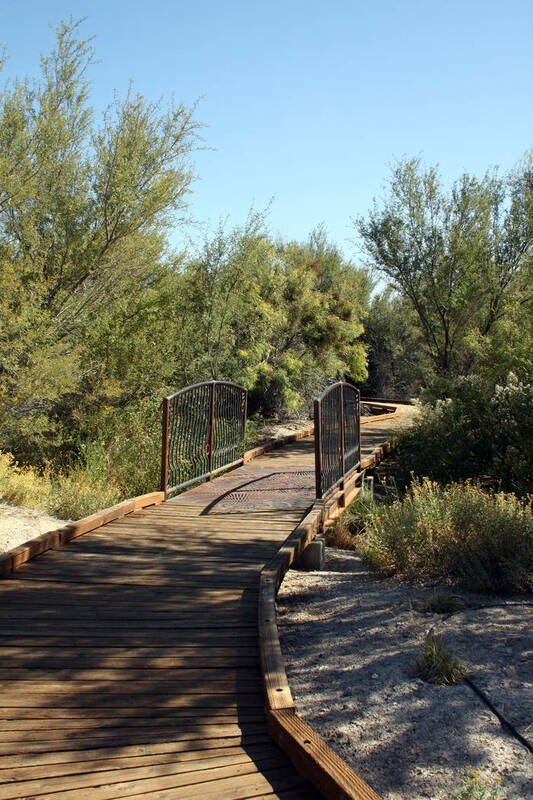 Deborah Wall Boardwalks can be found throughout Ash Meadows National Wildlife Refuge. The Nevada refuge encompasses about 24,000 acres, including seven major springs and their accompanying wetlands. These springs and seeps pour out about 10,000 gallons of water per minute. 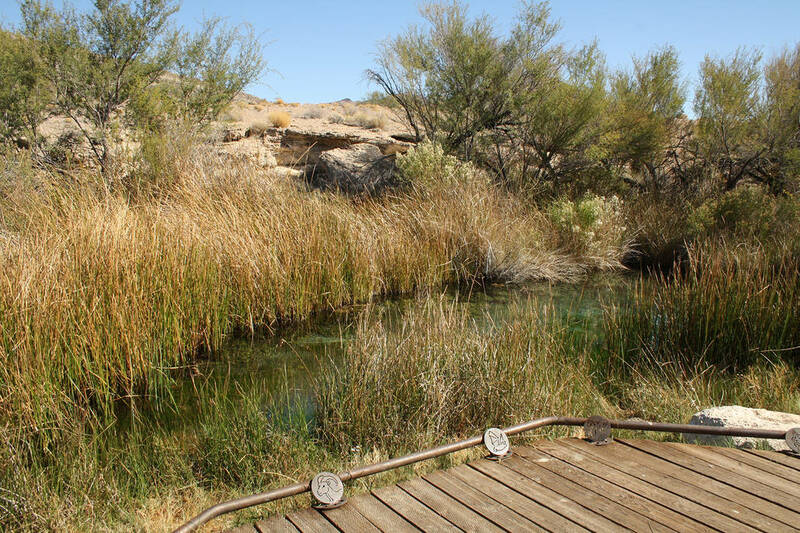 The springs, and the vegetation they water, provide rich habitats for wildlife, including 27 species of mammals, 275 birds that either live here or visit during the year and four native fish species. Of these abundant life forms, 26 are found nowhere else in the world, from the famous Devil’s Hole pupfish to particular pretty flowers. The refuge was named for the leatherleaf ash tree, which was very abundant in the past. Although there are still ash here, the screwbean mesquite is the most common tree. At an elevation of 2,205 feet, you can expect temperatures about the same as in the Las Vegas area. Start your visit at the visitor center where you can grab a map, check out the displays and get any pertinent information for the visit. From the visitor center you can walk directly onto the Crystal Springs Trail. It’s a one-half mile round-trip stroll on a level wood boardwalk, which leads you beside flowing springs and natural pools of clear water. This is a great trail for birding. If you only have time to visit and hike one destination, head to the Point of Rocks Springs area. There are bathrooms, a wonderful covered picnic area and a quarter-mile, looping wood boardwalk trail that accesses the King’s Pool, one of the highlights of the refuge. From the resting benches along the way, you have a very good chance of seeing wildlife, especially first thing in the morning. Once I was fortunate to see nine desert bighorn sheep at King’s Pool. This is also the best place to possibly see the Amargosa pupfish. The males are blue and less than 2 inches in length, yet often larger than the females, which are green. These fish can survive in water an inch or less deep and as hot as 93 degrees. Note that the refuge is open for day use only. Less than an hour’s drive west of Ash Meadows is Furnace Creek, the hub of Death Valley National Park, California. If you plan on spending a couple of days in this area, think about staying at the Longstreet Inn and Casino, only minutes from the refuge, which has super food and clean rooms, or its RV park. Visit http://www.longstreetcasino.com for more information. The visitor center is usually open from 9 a.m.-4:30 p.m. daily, except some holidays. Call ahead at 775-372-5435 or visit www.fws.gov/refuge/ash_meadows/ . There are a few ways to reach the refuge but this is the easiest. From Las Vegas take U.S. Highway 95 north 88 miles to the Amargosa Valley turn off. Go left onto Nevada State Route 373. Drive for 16 miles and go left onto Spring Meadows Road. Drive 5.2 miles, then go right 0.4 miles to Ash Meadows visitor center.